After a gloomy day yesterday I am trying to regain a positive attitude today. But with Chris gone until Monday night, this is an enormous challenge for me. In order to remain more positive I can not think about my weekend to-do list. 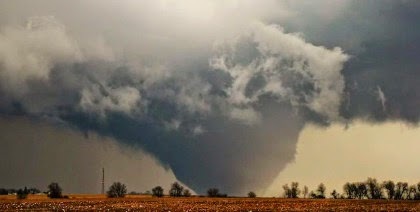 Last night a series of tornadoes ripped through northern Illinois. According to CBS Chicago, a massive “wedge” tornado virtually destroyed the town of Fairdale, Illinois, killing one woman, and injuring 11 other people. Another tornado also ripped through the town of Rochelle just after 7 p.m. The tornado in Rochelle did catch a dozen people of guard, trapping them inside a restaurant that was destroyed by the storm. As soon as they heard tornado sirens, they ran into the basement of Grubsteakers Restaurant, and ended up trapped there when the building was leveled. It took rescuers 90 minutes to pull all 12 people out of the basement of Grubsteakers. Fortuneatly they only suffered minor injuries. The tornado that leveled Fairdale passed through our county and the sirens went off around 8 p.m. All seven of us hunkered down in the basement and watched the news on television. The tornado's path went north of where we live. The only weather we experienced was hail, rain, wind, thunder and lightening. For the four younger Talbert children this was their first real experience with a tornado. Kitty and Monkey were terrified. Bear decided it was play time and Parrot fell asleep. I remember experiencing several tornadoes as a kid. When a storm was coming my dad would go outside and watch. Chris wanted to do the same thing last night. In the home where I grew up we had a nice basement with a full living area and television. Our family would go downstairs and sit and watch the news on TV. I don't remember feeling scared just a bit worried. In the basement I felt safe. Some homes in Crystal Lake don't have basements. I am glad that this one does. Today the storms have passed and the sun is shinning. Kitty noticed that the grass is getting greener. The trees are also starting to bud. Spring is here and we have a new neighbor. I keep on checking on her hoping to sneak a photo with my phone. But, I haven't seen her since this morning. Maybe I will be able to post her photo tomorrow. Our new neighbor is sleek and grey. She sings a mournful song and is making a home in the small bush in front of our house. This weekend I am going to put up a special place for her to eat and fill it with her favorite treats, canola, corn, millet, safflower, and sunflower seeds. Can you guess who our new neighbor is? I will share a photo as soon as I am able to capture her.